One of my favorite bands from the 1970s is Thin Lizzy. To be honest, I’ve not listened to them much in recent years. But about a month ago, my kid’s art teacher made some mixed CDs for the family and on one of the discs was Cowboy Song (Thin Lizzy). I hadn’t peaked at the song list and had no idea it was on there. But the first notes of the song took me back 30 years and I cranked it way up. I love that song. Since then, I read Mike Doughty’s post where he expressed his love of Thin Lizzy and have been led into the depths of YouTube by Jackson in search of old Thin Lizzy videos. It’s been fun going back to an old favorite. For those of you who are not in the know about Thin Lizzy, they were a unique kind of hard rock band. Led by an Irish lead singer/bass player named Phil Lynott who had an amazing soulful voice. He died young at age 35 but he made his mark. They played soul, hard funk, and boogie in addition to classic 70s hard rock. 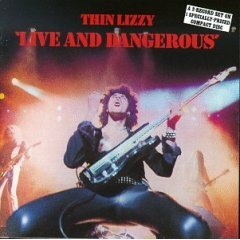 They’ve got a bunch of good studio records, but my favorite is the live record, Live and Dangerous. Here’s one of my favorite songs from it. I have heard that there are Wilco bootlegs out there with a cover of Cowboy Song on them. If anyone knows where to find them, I’d love to hear it. Newer post Freedom of Uploading? Older post MySpace Is For Adults?